Free Printable Cinco de Mayo Word Scramble. Free Printable Cinco de Mayo Word Scramble, great for your next 5 de Mayo celebration, friends reunion or just for fun. Who will be the first to unscramble all the Cinco de Mayo words in this game? The free Printable Cinco de Mayo Word Scramble includes a list of 16 scrambled Cinco de Mayo related words like Puebla, Mexican, Taco, Burrito, Mariachi, Victory, Zaragoza, Sombrero, Fiesta, Dance, Battle, Amigo and many more. You can find the answers in page 2. 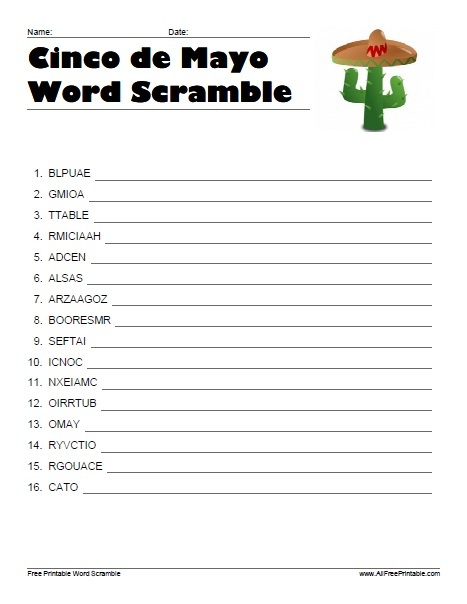 Click the link below to download or print the Cinco de Mayo Word Scramble game now in PDF format. Have fun at the Luau Party!